Today we the girls at The Digi Bell's are having blog hop to showcase the amazing new digi images "Summer Daze" by our so talented lady-boss Elisabeth Bell. My dear friends this is my last blog hop for The Digi Bell's DT, I am stopping with blogging for few month . Just need some time for myself and my family. TO WIN THIS DIGI......... Please remember to leave a comment on EACH stop of the hop. The Blog Hop will end at 9 am Arizona time on 27 July. Your next stop on the hop is Alethea. CMC Copic Challenge Group - #46 "Big Hair"
MUST have LOTS OF HAIR! We want to see you use YOUR COPICS, ProMarkers, other alcohol markers or Colored Pencils!! -Use any image you want BUT MAKE SURE YOU LINK BACK TO THE CMC CHALLENGE in your blog post!! -ALL PROJECTS MUST BE NEW & NOT BACK-LINKED!! -Image MUST be colored with Copics, ProMarkers, other alcohol markers or Colored Pencils! -NO more than 3 projects may be entered. Have fun coloring and do come join us HERE. For my "Just Because" card I did use this cute image "Gemma the Giraffe". 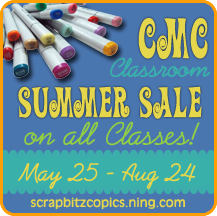 Color Me Creative Classroom have Summer Sale. It's a time for new challenge at CMC Copic Challenge. NEW CHALLENGE #45 will run until June 22nd! 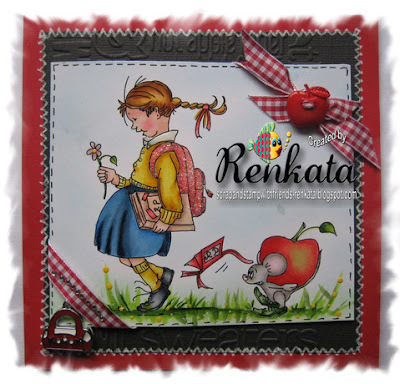 One lucky winner will win 5 digi stamps of their choice from I Brake For Stamps!! sponsor "I Brake for Stamps"
The image is colored with Copics. Have fun coloring and do come join the fun HERE. Welcome to a special Color Me Creative Challenge Blog Hop! The Design Team has put together some fabulous creations using Saturated Canary’s digital images to kick-start the CMC Summer Sale! Starting May 25th thru August 24th all CMC Classes will be on sale and bundled classes will be on special too...see the CMC Classroom for more details! It’s a fabulous time to take advantage of classes and once you sign up you get a full year in each of the classes you register for...but you can also buy them now and SAVE them to start this fall...your 1 year term does not start until you sign into a class. 7 Kids College Fund! We hope you enjoy the hop and thank you for joining us today. Be sure to stop over and check out all the classes offered at CMC! For my card I did use the adorable digi image from our sponsor " So Sorry" . She is just so cute and adorable. She is coloured with Copics in Hot Pink and Green. I am last of the hop, so be sure to visit all my DT sisters -starting HERE. Have Fun doing the Blog Hop! For my card today I did use this cute buddy " Bongo". Do you have a best buddy, I think whit this image you can make a special card for your best buddy ,lol. Image is coloured with Copics. Do you want to learn to colour as a pro. Well, HERE is the place for that. Today we the girls at The Digi Bell's are having blog hop to showcase the amazing new digi images "Little Lamb" by our so talented lady-boss Elisabeth Bell. Please, Please remember that the digital images are not for share!!!! Now is time to hop over at Alethea's blog. Have Fun doing the Blog Hop. I will take a two months break from blogging. All my post are schedule. Wish you all a magical weekend. For my card today I did use the adorable image, which I think is just good for a boy or for a man card, lol. The image is coloured with Copics. I did get my inspiration for the uniform from Chicago White Sox team. For my Menu hanger I did use the digi image Grillin George. he is coloured with Copics. Have a wonderful and yummy BBQ! Today We the girls from CMC Copic Challenge group are doing a blog hop to celebrate Suzanne J Dean birthday, the owner of Color Me Creative Class Room. If you came here from Shelby's blog you are on the right place. Well my card is about her new car accident last year. I am sure Suzanne know what I am talking about, lol....... Well Suzanne this one no one can hit. I wish you a wonderful and special birthday with your family and friends! You can visit the store HERE, I am sure you will be amaze. For my card today I did use the digi image "Military Molly", she is coloured with Copics. Isn't she precious ?! The image is just really great to make someone happy somewhere there in military. New adorable Digi images by Elisabeth Bell and Blog Hop! 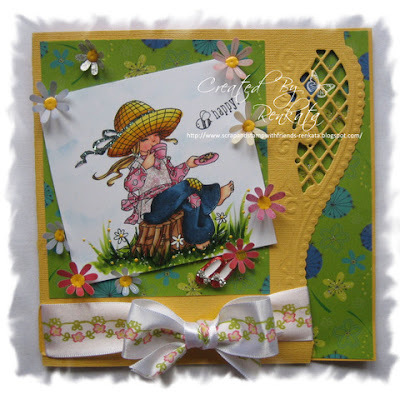 Today we the girls at The Digi Bell's are having blog hop to showcase the amazing new digi images "Peek-a-Bunny" and "Easter Basket" by our so talented lady-boss Elisabeth Bell. Please remember to leave a comment on EACH stop of the hop to better your chances to win one of your choice so very sweet little digi. The second way to win is to make a card and post it on the Digi Bell Blog - " SPRING FLOWERS " using ANY Elisabeth Bell image you may have. This will end on May 4th at 9 AM Arizona Time and the winner will be posted on the Digi Bell's blog next morning. Please, Please remember that the digital images are not for share !!!! If you came here from sweet Wendy you are on the right place. Now is time to hop over at sweetie pie Nikki . For my card today I did use the did image "Safari Daisy", she is coloured with Copics and she is ready for some adventure, lol. For more inspiration from the DT , please visit our blog! I am away for a little Spring break. For my project I did use "Smarto the Dog" and background image "Brick road Castle". Don't forget to visit our blog for a lot of inspiration from the DT. Pull out any image you wish and color it with some pretty spring color combos however you'd like with your alcohol markers and pencils! Have fun & try something new or just use your favorite technique!! Happy day my lovely blog Friends! For my little tag I did use the digi image "New Car". This cute little car is coloured with Copics. Isn't it just adorable. Wish you all a fantastic day! I have been MIA, the last few days, but so much going on right now. Today I will show you my card for the The Digi Bell's post with one of the new digi images Sweet Tooth Mary by Elisabeth Bell. She is coloured with Copics in RED. Isn't she just gorgeous? !